I have started to do the Academy Falcon, and below are some shots of the pit and seat. These are right of the box. 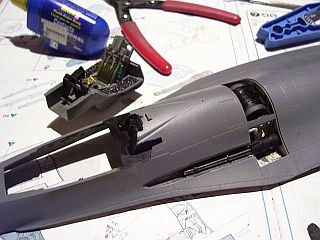 I also have the side walls installed into the top halve of the fuselage, aswell as the gun assembly. I am letting all of these set over night, before I join the two fuselage halves. I have just about finished detailing the gun assembly aswell. When it is ready I shall post some pictures here. I think the cockpit and seat have come out really well, especially as I didn't go for the extravagance of after market stuff. Well, I shall finish for now, and post somemore tomorrow. more on with the progress of my Falcon. As you can see, there are a lot of colours required to complete this kit, and probably, most of them will be little areas where hardly any paint will be used at all! The sidewalls are fairly similar, and this is the first time I have built a model where they are included, so it is nice to have a full cockpit! 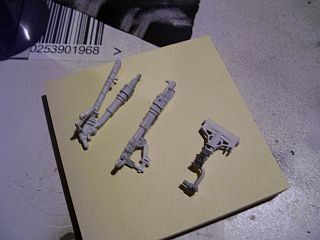 The gun assembly was easy, and I have weathered it with Tamiya smoke, which seems very effective. 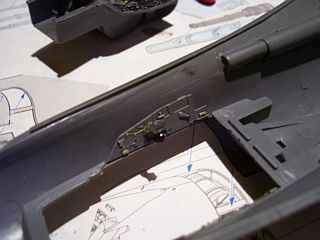 The undercarriage is very well detailed, and I shall be paying special attention to this area to see if I can make it look as realistic as possible. I am struggling finding a decent image of this, so if anyone has one please post it here, thanks! I thought I would include a shot of my modelling space, I am confined to the atttic, which is great as I don't get disturbed up here! The fuselage went together reasonably easy, though I had to pay special attention to the front on both sides as the top and bottom halves were out of line at this point. So with some prodding and poking and masking tape it eventually went into place. If I now follow the instructions to the letter, I should add the undercarriage? 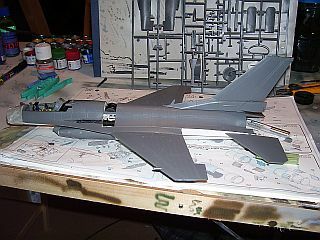 I think it might be better to add the wings, tail plane etc, and start the paint job before I do this. Stay tuned, as I will be adding to this shortly. 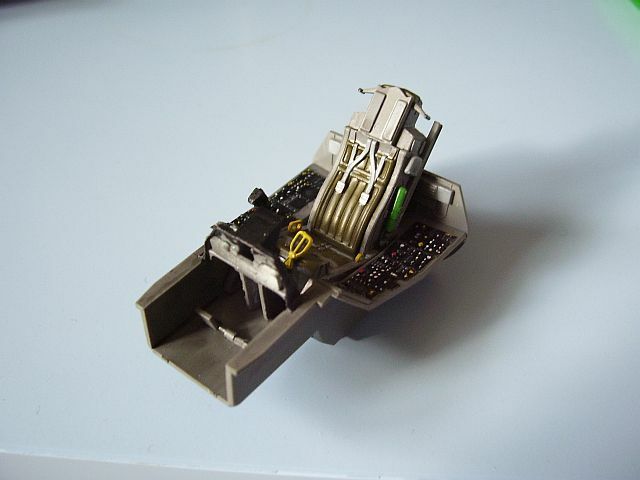 Hi Ian, you've done a very good job on the cockpit, with everything nice and crisp, proving that if the basic kit is sound, you don't need a lot of expensive AM stuff to produce a first-class model. I'm not much of a jet person, but I will certainly be looking out for your next updates. This is where I am too with the falcon this evening. 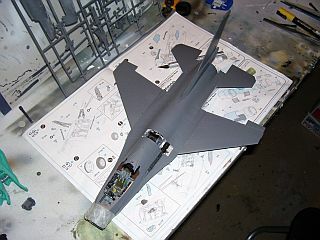 I have only dry fitted the tail peice to see the profile, but the wings and tail planes are in position. The fit of the wings isn't great as there are gaps from front to back, so i will have to do some filling and sanding. Also I have started to assemble the landing gear. Hope you like it so far, I think it is a very interesting kit and I look forward to working with it some more. And Jean, thanks for the comments, they are very much appreciated! Looking good so far. Sure goes together quickly for a large jet. You'll be giving Erwin a run in the speed building stakes at this rate. Thanks Matt, who's Erwin??? Don't feel like I am rushing, just had some time on my hands for a change. Looks great so far and looks like it's going together pretty fast. It reminds me that I really need to just dive in and finish and build something eh? the gears look good mate I hope those sink marks didn't cause to many problems, As for the fuselage parts I seem to have step between the top and bottom part nothing a little sanding can't fix I just think its wierd that's all. 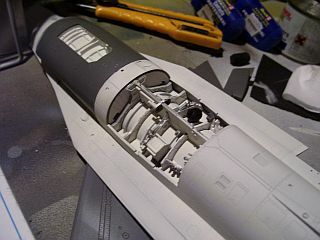 I have a little step on the join of the fuselage halves to, this I am going to sand and it should disappear. 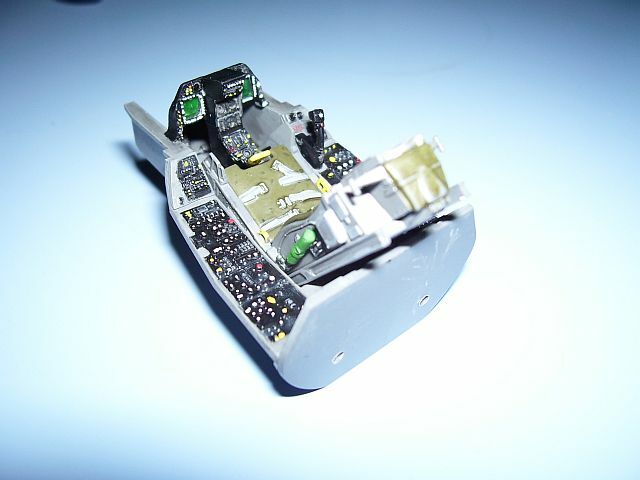 I am going to display the gun pod open, looks cool! Hows your pit coming, I really enjoyed doing mine? 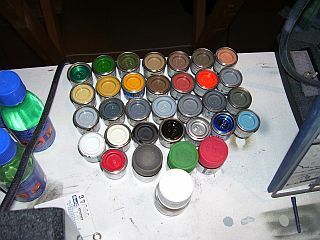 I thinkn I have almost the entire paint range now, tons of the stuff, ha. Disaster struck, I took a nice slither out of the side of my thumb with my exacto blade. 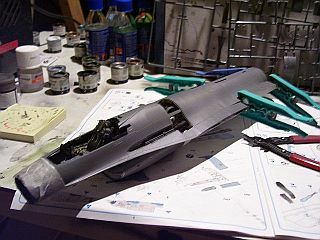 Still, I put a plaster on it, and I shall wait till tomorrow and crack on somemore with my Falcon. I need to start doing some filling along the wing to fuselage seems, then the dreaded sanding. Other than that minor set back, tally ho! well back on with the F16, it took longer for my thumb to heal than I thought it would, but all seems well now. I have been filling gaps and sanding for about 8 hours now, and it is the part of the hobby I enjoy least. Sorry I haven't atken any pictures of it yet but rest assured I will post some any day now. 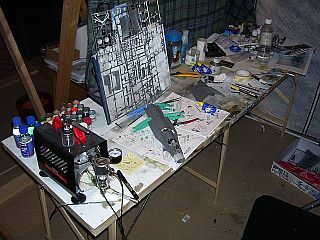 I hope I don't get into trouble for posting this here, but I had been posting on the progress of my F16 in 1/32 in group builds. Due to time restraints I haven't posted on it in a while, but now I am able too, but it has dissapeared ands been archived maybe? How can I bring up the original thread and continue posting on it?